The temples were last inhabited in 1975, but were recently renovated as part of efforts to assert Vietnamese sovereignty over the Spratly Islands. 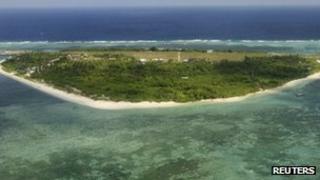 China, Vietnam and four other nations claim parts of the sparsely populated islands in the South China Sea. The area is believed to hold vast oil and gas reserves. The monks' delegation is being organised by the local authorities in the southern province of Khanh Hoa, which exercises administrative responsibility for the islands on behalf of Vietnam. It has also paid for the refurbishment of the island shrines. They include three larger temples and several smaller ones. The monks have been appointed abbots of the island temples for a six-month period. Their duties will include taking care of the shrines and attending to the spiritual needs of the islands' small population. The islands have no indigenous population and just a smattering of military and industrial settlements. He said he had been inspired to do so while officiating at services commemorating the deaths of three Vietnamese sailors killed in a 1988 naval skirmish with China near the islands. Thich Giac Nghia said he would pray for "anyone of the Vietnamese race" lost at sea in defence of Vietnam's claim to the archipelago. "I will offer prayers for them to empower their souls to reach peace and relieve their sufferings." Along with China and Vietnam, parts of the islands are claimed by the the Philippines, Brunei, Malaysia and Taiwan.